Robin is a co-founder and director of C4A and its flagship group, the Bow-Dacious String Band. In addition to her administrative duties at C4A, Robin maintains a small private studio, teaching violin, viola, and fiddle, teaches adult violin group classes, and directs the Bow-Dacious String Band and the Olde Music Baroque and Renaissance Ensemble. 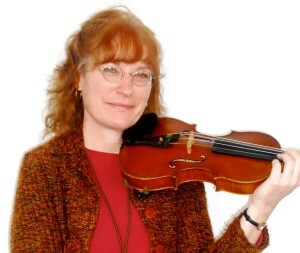 She has enjoyed performing with professional orchestras and teaching violin and viola since 1983, and is currently the principal violist with the Champaign-Urbana Symphony. She loves to play non-classical music styles too, and has performed with bands specializing in Argentinean tango, old-time, bluegrass, country, klezmer, and café music. She currently plays with a 10-piece ensemble, the Knights of Cabiria, and frequently performs in smaller groups with her husband and friends. Robin certified to teach the Alexander Technique in 1996, and since then has helped numerous musicians, dancers, computer users, and more to work and play more efficiently. 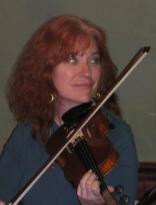 In recent years she has enjoyed teaching the technique at the Appalachian String Band Festival, known as “Clifftop,” in West Virginia. 2015: elected by her peers to serve as orchestra representative on the Board of Directors for the Champaign Urbana Symphony Orchestra. 2015: selected to attend CAELI, an intensive leadership conference held by the National Guild of Community Arts Educators. 2012: first place winner of the open division of the Illinois State Fair fiddle contest. 2009: Bow-Dacious String Band received the ACE award for representing C-U outside our area. 2007: Robin received the ACE award for outstanding arts educator. 2007: served on Urbana Public Arts task force for creation of Urbana Public Arts Commission.